Martha and I have been exploring all kinds of options for moving to San Diego early in the New Year, and it's gotten me thinking about beaches again. 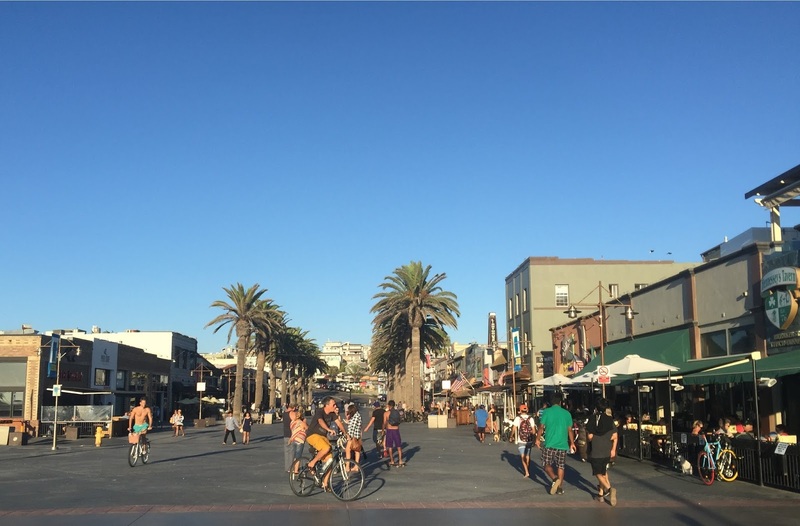 I thought I'd already posted about my stay in Hermosa Beach, but I couldn't find any trace of it, so now seems like a good time. It was a great stop, so I didn't want to forget all about it. The beach itself isn't a whole lot different from others in southern California. It's nice and wide, and has lifeguard stations. It has a good long pier, which I like. So I was able to stay out of the sun if I wished, yet easily able to move back into the sunshine, too. It also has bathrooms placed very conveniently next to the pier, which I also like. It had both volleyball nets and a long boardwalk. There were a few different things about this beach worth noting, though. Major and minor, good and bad. 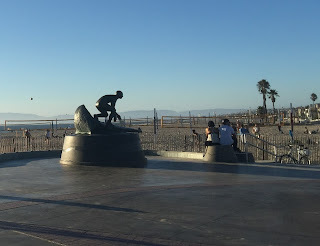 For one thing, it has that cool statue of a surfer which is shown at the top of this post. It's not something I would have missed if it hadn't been there, but it did lend a bit of individuality to the beach. The best thing, though, was the block right in front of the beach. It was a wide cobblestone pedestrian area lined with a few shops, but mostly places to eat and drink. With rows of palm trees, this was a fabulous place to hang out. What it doesn't have is free parking nearby. Although not directly on the boardwalk, as in San Diego, the hostel I stayed in was just a couple of doors down from the beach. I ended up having to walk several blocks with my bags after finding a parking spot that was free for over 24 hours. Fortunately, I had a new 4 wheel spinner bag and a great deal of experience in packing light. My room at the hostel was on the top floor of a building with no elevator or air conditioning. But since there was a great breeze and, as previously mentioned, I had packed light, I decided the view made up for any inconvenience. Just up and across the street was Cafe Bonaparte, which had our beloved outdoor tables and a very reasonably priced selection of meal options. At the end of my day at the beach, I thoroughly enjoyed a very tasty spinach and feta croissant and a delicious dessert while looking out toward the ocean. 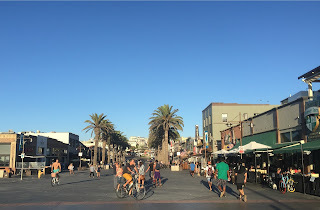 I only spent one night in Hermosa Beach. But since there is a hostel practically right on the beach, with good kitchen facilities and great places to hang out right out the door, it makes a wonderful inexpensive beach break. So I definitely wouldn't mind going back for a few more days. We welcome all comments, questions, observations and requests. Oh, and when you see "No Comments', it just means there aren't any yet, not that you can't make one. Click on Post a Comment, or just type in the comment box if you see it, and tell us what you're thinking! Hi, I'm Rebecca, and I'm always on my way to somewhere...else. I've been roaming around Europe, UK, Mexico and more, so this blog was keeping family and friends - online & irl - updated. But everyone is welcome to join in, the more the merrier. Mostly in Mexico these days, but still traveling and always a backlog of locations to write about.